The Migraine Association of Ireland is a registered charity – Registered Charity Number is 20030414, CHY Number is 11252. The MAI is a Company Limited by Guarantee and is fully registered with the Charities Regulatory Authority (CRA). It is also listed on the Register of Charities. The Migraine Association of Ireland (MAI) is committed to complying with the Guidelines for Charitable Organisations on Fundraising from the Public. The MAI fully complies with the Principles of Good Governance as outlined by The Governance Code (a code of practice for good governance of community, voluntary and charitable organisations in Ireland) and is listed on the Register of Compliance. 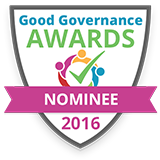 Please click here for the MAI Statement on the Principles of Good Governance 2018 MAI was shortlisted for the inaugural Good Governance Awards in 2016 for our Annual Report. HSE Section 39 Grants and the Department of Rural and Community Development’s ‘Scheme to Support National Organisations’ (SSNO) pay 100% of staff salaries, therefore no fundraised money is used to pay for salaries. No special allowances are paid to staff e.g. Away from Home Allowances, Maternity Benefits, etc. MAI work is also supported by occasional corporate funding in the form of unrestricted educational grants, which are governed by a strict code of guidance. Experience: 30 years business sales experience, involvement in youth work and a long term active member of the Cork Migraine Awareness Group. Experience: Chartered Accountant and Financial Controller of a diverse range of private companies. Experience: President of MAI, immediate Past President of both the European Headache Alliance (EHA) and the European Federation of Neurological Association (EFNA) and internationally acknowledged patient advocate. Experience: Business Consultant and served on numerous other charitable boards. Experience: Long time active member of the Cork Migraine Awareness Support Group. Experience: Graphic designer and psychotherapist, has developed self management programmes for chronic pain conditions. Previously a board member of FibroIreland. Experience: Historian, Author and current Director of Irish Humanities Alliance, has served on several boards and committees.